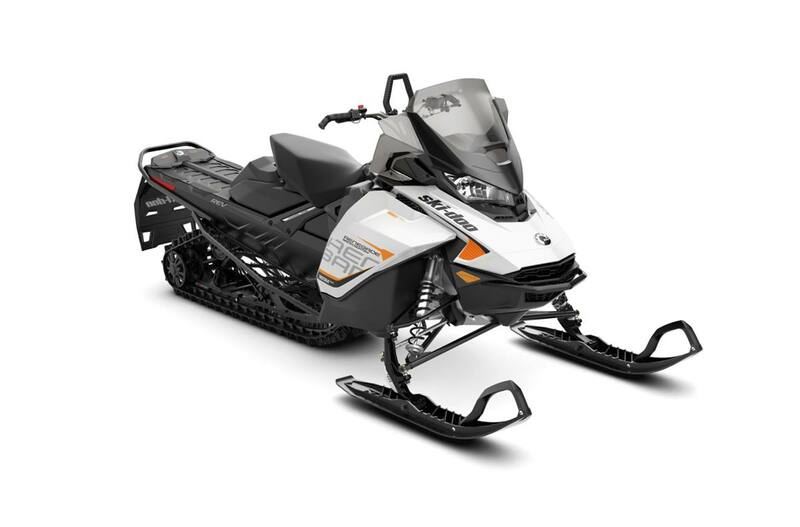 With the latest technology and design, the 2018 Renegade Backcountry 850 E-TEC sleds are the best of all worlds – and the premier crossovers in snowmobiling. cMotion™ rear suspension: Crossover-specific suspension uses best principles of the rMotion™ trail and tMotion™ mountain skids for confident cornering and agile boondocking. Cobra 15 x 146 x 1.6 in. track: This track features combination of flexible cupped lugs for superior off-trail performance and more rigid lugs for added traction on hard-packed snow. pDrive™ clutch: Fast and friction-free dual rollers transfer torque in place of traditional sliding buttons on this 100% new clutch. Ultraresponsive shifting, impressive RPM consistency and lightweight. Vehicle overall length: 3,275 mm / 129 in. Vehicle overall width: 1,140 to 1,180 mm / 44.9 to 46.5 in. Ski stance: 975 or 1,020 mm / 38.4 or 40.2 in. Track nominal length: 3,705 mm / 146 in. Front suspension max. travel: 220 mm / 8.7 in. Riser block height: 120 mm / 4.7 in. Windshield: 430 mm / 17 in.